Heat – Treated, Precisely Ground – Alloy Steel – Gears, Shafts & Pinions. COMPACT AND LIGHT WEIGHT :Manufactured from the highest quality steel materials. Offering a light weight, but robust, exceptionally strong product. The compact size offers the advantage of convenient portability, easy installation and simple relocation. 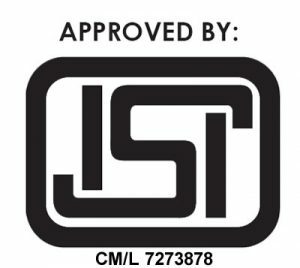 Superior quality and performance is assured by exclusive, improved process technology and years of experience. SAFETY BRAKE : The Precision Ratchet Disc Type Auto Brake engages instantly when operation is stopped, holding the load securely. High quality material ensures reliability, even after long term use. 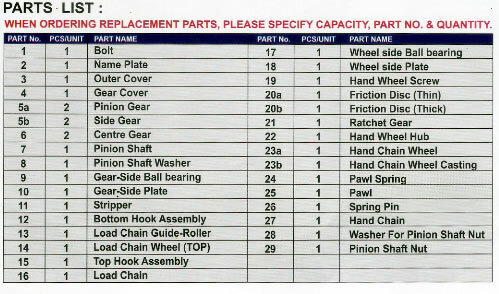 HAND CHAIN WHEEL : Made of sheet steel, hence there is no possibility of breakage.Provided with guides. HAND CHAIN : As per I.S.S. 2429 M.s. Calibrated. MINIMUM POWER FOR OPERATION : “SPEED” S-SERIES Chain Blocks, produce high mechanical efficiency, due to high gear ratios and the uses extra ball bearings. Thus, outstanding work output is attained, with minimum manual effort. 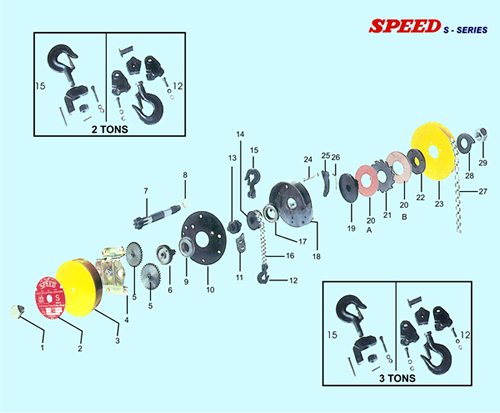 LOAD CHAIN WHEEL : Made of Malleable casting Precision machined and mounted on ball bearings. LOAD CHAIN : Load Chain is made of Special alloy steel. Heat treated to prevent elongation, for high tensile stress and has the durability of a continous long term use. it is very resistant to wear.Confirms to I.S.S. 6216- Galvanized. PROOF LOAD TEST : Each Chain Block is tested To 1.5 times its rated capacity.